Butterflies - The Next Jet Set Radio? Most people will have a game they’ve been wanting to see made for a very long time. I have a personal list, and right at the top is a third Jet Set Radio game. Hell, I even made a video talking about all the stuff I’d want in the game! Unfortunately, SEGA hasn’t seen the potential in making another installment of roller-blading, graffiti-spraying madness. So instead, the fan community is left to make their own tributes to Jet Set Radio. There’s been demakes, multiplayer remakes, and some…other attempts. However, there’s also been efforts to make spiritual successors, with fan projects like Jet Set Radio Future, and fully realized titles such as Hover: Revolt of Gamers. But this project is one that I think may satisfy the fans once it’s fully completed, and it’s called Butterflies. Butterflies is a game being created by a developer known simply as “Le Capitaine”. They’ve worked on the project solo for about three years, with some help from a few composers. If you take a look at Capitaine’s itch.io page, as well as this Jet Set Radio fan compilation, you’ll notice that Butterflies has undergone a few changes, in name and in style. Despite the growing pains, it’s a vibrant indie game that seems to have the essence that Jet Set Radio once possessed. Right now, the game is currently in development, with the first episode, “Rudies”, released on itch.io. You can skip to the next section if you’d like to avoid story spoilers. There’s not too much to delve into with the story. It’s the first episode, which means that we’re really setting up the world for the next chapters to follow. You begin with Nat, an afro-haired youth with a desire to make art, much like the Rudies from Jet Set Radio. Although it’s not directly confirmed, it’s heavily implied that this game takes place after the GGs’ adventures. There’s no one left that’s making graffiti, and Nat wants to change that. After a quick cutscene that shows Nat picking up a spray can (more on that later), you’re dropped into the first area and allowed to explore. Spraying graffiti murals and completing challenges will unlock more story missions. In this first level, your main obstacles are recruiting new members to your squad, and avoiding law enforcement. Two other youth appear to challenge Nat’s claim to the area. There’s Jae, a girl with a little heart tattoo on her left cheek, who likes to bust out a whole lot of tricks. Our other character is Zinnie, a speed demon rocking a blue hoodie who wants to dominate in any way possible. As Nat proves their worth, the other two join the cause to paint the city with their expressive art, and fight against the Keisatsu (which literally means “the police” in Japanese). The Keisatsu, or KS, are trying to stop these skate-wearing punks, and will do anything possible, including sending a rogue police car after them, which is really quite drastic. After their encounter with the law, the trio discuss their next move, which is obviously to take over the ENTIRE CITY, right? Well, not exactly. Based on what’s said, it seems the next chapter will be a fight for dominance against the city’s biggest gang, the Rodrats. Who knows what could happen? To the unobserving eye, Butterflies may seem rough around the edges, unpolished, perhaps amateur. However, that’s very much a disservice to what Capitaine is trying to accomplish. The art style is quite unique; it combines the futuristic feel of Jet Set Radio with a hand-drawn style filled with jagged edges and watercolours to bring life to the world. It’s not as bright as Jet Set Radio, but that’s not a bad thing. Butterflies still uses some stylistic elements from its SEGA predecessor; the character models have quite vibrant colour schemes that contrast the drab look of the first level’s skyline. The user interface is also quite bright, using various neon colours to keep the player’s attention. Another element I really liked that Jet Set Radio doesn’t use as much is the references to inline culture and graffiti culture. Each mural type you spray is named after a real-world type of graffiti, and the skates act more realistic; depending on your speed, you might walk down a set of stairs or roll quickly. The attention to very small details is very accurate and it’s really not something I can say I’ve seen a lot in other titles. With that said though, there’s still some issues that are present, which comes with the game still being in development. The UI, in particular, is quite simple, but some of the elements are very odd. The direction arrow is something I like, but it can get in the way easily. Sometimes, it doesn’t calibrate properly, and you’ll have a tough time finding your next objective. The graffiti meter is also really hard to read; I’m not sure what I’m even looking at sometimes aside from two asymmetrical meters. These aren’t my biggest criticisms of the interface, though; that honour goes to the speedometer. I really like the design, but the layout seems off. The lightning bolt is easy to read, but having the numbers go vertically wasn’t the best decision. There’s lots of unique things about Butterflies, but they’re not all great, and this isn’t great. I do like the health bar, although I didn’t really know that combos heal when I started (I learned eventually)! The skyline in the first city is laid out well, but there were times where I found the boundary easily. Now, this game is being developed in Unity, which has its limitations, but so far, Capitaine has managed to work around them and has done it well. But, it’s still easy to be jumping around and suddenly find a barrier that looks like an explorable area. This isn’t a big deal, but maybe having a fence or concrete wall to match the aesthetic and act as a boundary could be a good solution to this issue. I’m sure most of these issues will be fixed in the final release. Fingers crossed. One of the biggest elements of “extreme sports games” is music. Whether it’s original or licensed, the soundtrack needs to push the action forward. Games like Tony Hawk’s Pro Skater opted for a fully licensed soundtrack. Meanwhile, titles such as Jet Set Radio used composers to shape the soundscape, and then sprinkled in some licensed music to diversify the selection. Based on what I’ve heard so far, Butterflies seems to lean into the Jet Set Radio direction. Most of the soundtrack is composed by artists found by Capitaine. Notable tracks include Highraiser’s “Dawsheeraque” and “Meaveena”, which introduce the title screen and story respectively. There’s also “On a Mission” from Unknown Meta, which borrows a lot of acoustic instruments and combines them with electronic drums & familiar samples to create a fast-paced track that keeps the energy up. My personal favourite selection would have to be Le Capitaine’s take on Hideki Naganuma’s “Sneakman”, “Sneekboi”, which strips the elements down from the original track, and builds this really cool lo-fi breakbeat. I made sure to loop it on repeat. The game does allow you to skip through the soundtrack, a feature not found in any Jet Set Radio game. However, it seems to shuffle the tracks in a random order, rather than having them in the same list every time. It’s not bad, but having the option to shuffle or not to shuffle may be more beneficial to the player depending on their mood. Overall, the game’s combination of good music and interesting visuals should keep you playing for quite a while. There’s no other way to say it; Butterflies is simply fun. To say that it’s reminiscent of Jet Set Radio is a fair comparison, but that’s not telling the entire story. While you can still jump on rails, soar through the air, and chain lots of tricks together, many of the major gameplay elements have been changed drastically. The biggest change certainly has to be the lack of spray cans littered across the city, as Butterflies doesn’t actually require you to use them. At first, I thought it was based on momentum, but right now there’s no limit to sprays. Whereas Jet Set Radio has varying sizes of graffiti spots, Butterflies allows you to choose what you’d like to paint. If you’re looking to hit many spots as quickly as possible, the game allows you to spray the smallest mural, and counts it towards the level total, so that you can get closer to more story objectives. If you want to stick around and paint, that’s totally cool too; it’ll give you more points in challenges. This system gives the player the choice with the mural size and keeps the action moving. A suggestion to keep this fresh without every player simply tagging quickly would be to have each character have a selection of each mural type, and have them randomize at every opportunity. Nonetheless, I think this system is a good improvement on what we’ve seen from Jet Set Radio. Even though you might need to do some tricks before you can spray a mural, at least you don’t have to go running around for spray cans. It wouldn’t hurt to have a couple of quick sprays to pay homage to JSRF, though. Also, make the dang meters easier to decipher! Please. 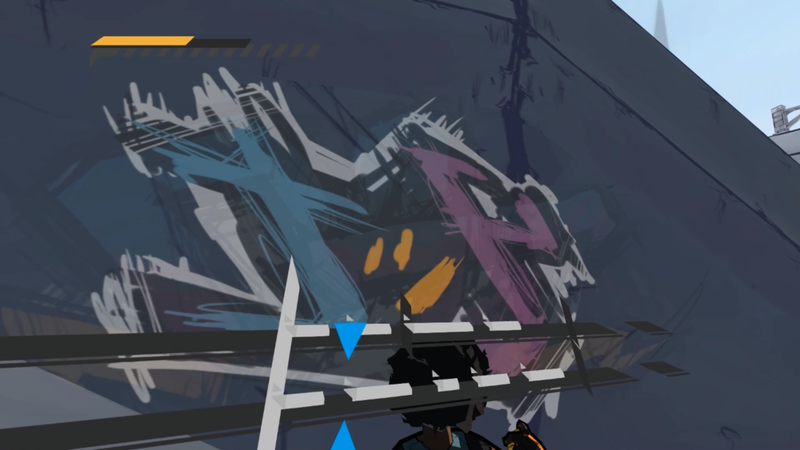 The graffiti system, while new and exciting, has probably the weirdest metering I’ve seen in a video game. Dashing in other titles is used simply to build speed, but Butterflies makes it an integral part of the game. As you move around, you’ll be able to time your button presses when your character’s skates hit the ground, and keeping the rhythm going will increase your momentum. The best way to know when to start button mashing is to look for faint, blue sparks; that’s your cue to start getting some speed. It’s fun to gain some speed, and it allows you to do some more tricks, while also making racing much easier With these two deviations in gameplay, Butterflies has changed how skating games can be played. It still has that familiar feeling that Jet Set Radio presents, but it almost feels…refreshing. I also like that doing tricks is still as easy as it was in Jet Set Radio and JSRF. You simply hit the trick button and move a direction to change it up. Nothing too fancy, but sometimes I couldn’t get it to do what I wanted. It may have been my controller (which is encouraged over a keyboard), but if I didn’t have a lot of momentum, it was tougher to chain tricks together. Not as easy as Jet Set Radio, but still fun. From a design standpoint, Capitaine has made the last three years count. Aside from the gameplay, the first level is well thought out. Being a small neighbourhood city built into a giant mountain range, there’s lots of areas for you to explore in this first area. Small hills, various skylines, and even a sewer area give you opportunities to test out the controls and figure out how everything feels. It really reminds me of Benten-cho from the original Jet Set Radio, with some pieces of Shibuya-cho. Every part of the game is created with a purpose; making larger graffiti murals will get you more points, building speed makes certain jumps easier, and being a public nuisance will cause the police to chase you. It’s subtle, but a very important part of Butterflies. There’s also various missions across the map. Usually, they involve doing a continuous combo, or racing around the city before the timer runs out. The missions are used to add to your overall point total, similar to the graffiti spots. It’s not perfect though; the AI for the police is clunky as all hell, but their security cameras can somehow shoot electric beams that nail you almost perfectly every time. Moving around the level is quite easy, perhaps even too easy. The controls are quite floaty, and there weren’t many times I wasn’t able to land easily or hit a rail. Some objects didn’t function the same as others; I found some buildings that you could grind on, but others you couldn’t. All of these things may seem minute, but you have to remember that even when Jet Set Radio had similar issues, they weren’t as prominent, and didn’t directly affect gameplay. I’m not saying I didn’t have fun playing the game, but there’s some tweaking to do here. Despite all my nitpicking, Butterflies is still a lot of fun. It brought out a lot of feelings I had when I first tried Jet Set Radio Future on my babysitter’s Xbox. That wonderful feeling of exploration, combined with pleasant visuals, a simple story of desire and expression, and some good tunes, makes me hopeful that Le Capitaine and the Butterflies team are going to make something really special. There’s still lots to do, and lots to tweak and fix, but this is only the first chapter. The story’s only just beginning! Butterflies can be played by donating to Le Capitaine’s Patreon, or by visiting the Butterflies game page on itch.io. You can follow the game on Twitter, or join the Discord server.